Occasionally, local-paper stories which my cartoons accompany turn up on the national news. You may have heard this week about the death of Britain's biggest freshwater fish. Two Tone was a, er, local fish, from the Canterbury area. Here's the cartoon I drew. "He was the carp of our hearts ... the people's oily freshwater fish ..."
It's a classic silly-season story if ever there was one, particularly when you hear that the fish has caused several broken marriages. 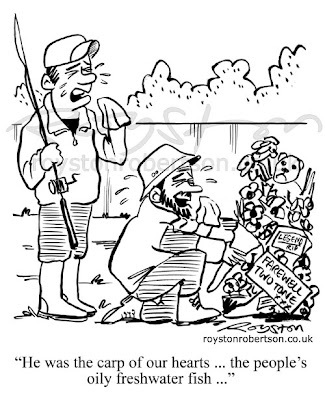 When I read that anglers were leaving messages of condolence on internet forums I decided the joke could be about the over-the-top way the public seems to react to death these days, and has done since the death of Princess Diana. 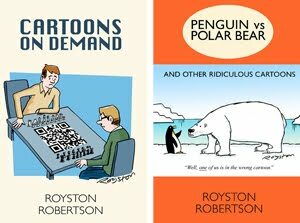 This cartoon shows that reference material can be a useful tool for cartoonists. I needed something to go with "the people's" so I looked up carp online and used the Wikipedia definition. I have to admit to chuckling at the idea of "the people's oily freshwater fish" as I drew! C´mon. Don´t blame it on the poor fish. I suppose anything could be a good excuse to finish a bad marriage, hehe. I don't know much about angling but I find the idea of them being upset by the death of a fish bizarre! I know a lot of fish get thrown back, like this one who was apparently caught about 50 times (! ), but surely a lot die too? With coarse fishing (pretty much everything apart from trout and salmon)you have to put them back, Royston - the sport is supposed to be in the catching. My dad has fished for carp for decades, but if you ask me the thing that makes fishing exciting is the thought that you might get to take something home to the barbecue!